If you have a kitty who loves to leap, consider making or buying a simple fishing pole toy for cats. The basic design features a toy suspended from the end of a long pole, and it lets your cat be active and enjoy herself while entertaining you at the same time. There are several types of fishing pole cat toys from which you can choose. The general design is the same for each of these types and includes a long rod, some type of tie or string and a toy on the other end of the string. Some setups are more elaborate than others, of course. Just like a regular fishing pole, many of these toys have reels to pull the toy back in. Catnip - Many fishing pole cat toys offer a toy at the end that has an herb called catnip inside. 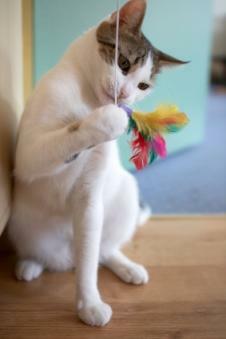 Many felines go crazy over catnip and will leap, jump and act crazy while trying to get to the contents inside the toy. OurPets, on Amazon.com, offers a fishing pole toy that has an actual reel, so you can cast and reel the toy back in. Squeaky - Some of the rod and reel toys have realistic squeaks that can make your cat think he or she has captured a live mouse. Amazon offers a version that has an interactive microchip. When your cat grabs the mouse, a squeak will sound. This one should provide hours of entertainment and time for you and your cat to bond, and it costs around $11.00. Feather - Petsmart and many other stores carry a feather toy attached to the end of the pole. While not technically a "fishing pole" cat toy, this toy drives cats nuts. They will leap, jump, twist and strain to get to the feathers. This toy can be great fun for your cat. This toy typically costs well under $10.00. You can make your own version with a used feather duster that you've cleaned thoroughly. Not interested in investing in another cat toy that your pet may just look at once and then turn his or her nose up to? You can easily make your own fishing pole cat toy. Think about how people used to make fishing poles or the things you used as a kid to make one. A long stick, some string and something attached to the end. A toy can be that simple. An inexpensivecatnip toy is probably your best bet, although feathers work well too. Some inventive owners even tie kitty's favorite treat to the end of the string. The key is to encourage your cat to exercise. This is vital to his or her health, especially in a climate where many owners keep their pets inside for safety reasons, and the cats get little physical movement. You can even purchase fishing lures with feathers and fun items at your local Wal-Mart. Just be very cautious that the lure does not have any hooks in it that might harm your cat. Most will have hooks, so you may have to search to find the ones that are hook free. The craft area is another good place to locate feathers and string to make your fishing pole. As with any toy, always supervise your cat to make sure nothing presents itself as a choking or strangling hazard. One of the best features of fishing pole cat toys is that the owner typically has to play along with the cat. This creates a strong bond and fun and relaxation for both pet and owner.